Anaïde Nahikian leads the Advanced Training Program on Humanitarian Action (ATHA) at the Harvard Humanitarian Initiative. Through field-based research and engagement with humanitarian practitioners, Anaïde focuses on developing responsive research and professional tools to enhance the capacity of professionals in humanitarian environments, on issues such as frontline humanitarian negotiation, response to forced migration, and communities of practice. She leads field research and implements projects across the Middle East / North Africa, East Africa, Southeast Asia, and Europe. She also produces and co-hosts the monthly Humanitarian Assistance Podcast. Anaïde is also Head of the International Committee of the Red Cross (ICRC) Collaborative Platform, where she initiates and manages relationships between the ICRC and academic, policy, non-profit, and private organizations in the Boston area around key themes and priorities of the ICRC, in partnership with swissnex Boston. 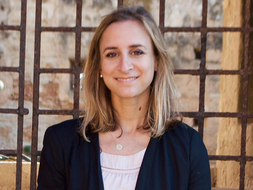 Anaïde is Associate Instructor in graduate courses at the Harvard School of Public Health and the Kennedy School of Government, leading the case research and curriculum design of an annual intensive, field-based course on strategic planning in humanitarian action, since 2008. She is currently an Adjunct Lecturer at the Heller School for Social Policy and Management at Brandeis University and an Affiliate at the Middle East Initiative at the Harvard Kennedy School of Government.